Need a crown? SAVE TIME AND MONEY WITH A ONE VISIT CROWN! The high cost of a lab crown can be painful, however a weak, untreated tooth can be a ticking time bomb, just waiting to crack – ouch! When it cracks it can lead to severe pain, an expensive root canal treatment, or the tooth may even splint in half. The One Visit Crown is a more affordable alternative to a traditional crown and a more durable option than a large filling. The One Visit Crown procedure is no more invasive than getting a filling and is completed in only one appointment, saving you valuable time and money. At Emerald Dental Care, we are Approved Providers for the One Visit Crown. A crown normally takes weeks to make – from initial consultation to fitting. 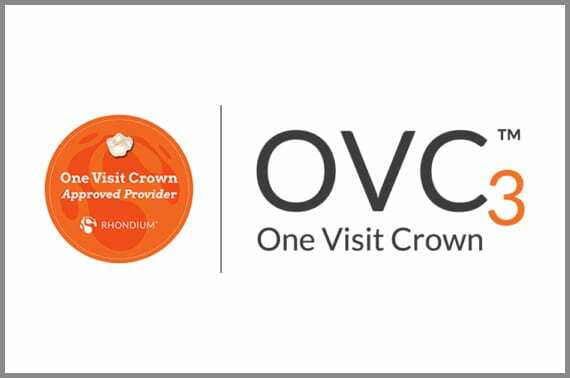 With the One Visit Crown, it’s all done in a single visit. This new technology makes your treatment affordable. As One Visit Crowns are more efficient, the time and money saved enables us to pass the savings on to you. The One Visit Crown looks like your natural teeth, so you can’t tell the difference. The One Visit Crown is a conservative option, designed to preserve your remaining tooth structure. This means less drilling than conventional crowns.